Although we grow a range of fruit and vegetables, it is the citrus harvest that can be truly overwhelming. We have 3 orange and 3 lemon trees as well as a mandarin, grapefruit and lime. The lemons are the least prolific, I manage to use the limes as they are ready, we eat the mandarins but the grapefruit and oranges are simply too many to manage. So, we juice them and freeze the juice in 2 litre ice-cream tubs for use throughout the year. 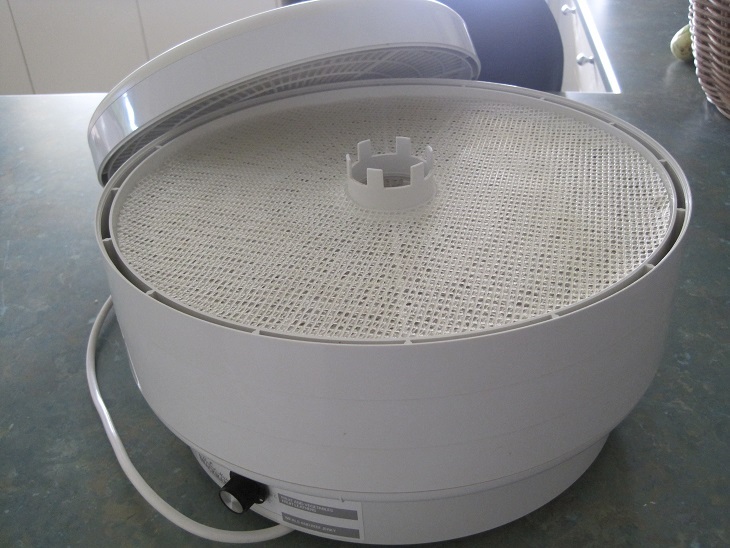 I had a citrus juicer attachment for my food processor which has worked admirably for a number of years. However, last year it became obvious that it was failing. On closer examination, I discovered that several of the plastic cogs which drive the mechanism had broken. As the season went on a few more broke until the attachment was pretty well useless. Over the past 6 months or so we have researched and discussed our options as it is clear that we need to have some sort of electric citrus juicer. I contemplated buying a replacement attachment for the food processor but it did not appear identical to the original and there was the small issue that it would only last a few years before ending up in the same state as the existing one. We finally decided to bite the bullet and buy a commercial-grade citrus juicer from Ceado (an Italian brand). We picked it up last week and I have now re-arranged my appliance cupboard to make space for it. Here it is – bright, shiny and ready to use. With the lid opened you can see the reamer cone and the press which holds the fruit in place. We have been picking limes and a few lemons in the past couple of weeks, however, the purchase is very timely as the grapefruit are ripening quickly and we will be picking them by the bucketful within the next few weeks. I know that the juicer will get a real workout and I look forward to sharing the results with you. Do the tears flow when you start cutting up onions? Here is a way to minimise the suffering in the long-term. 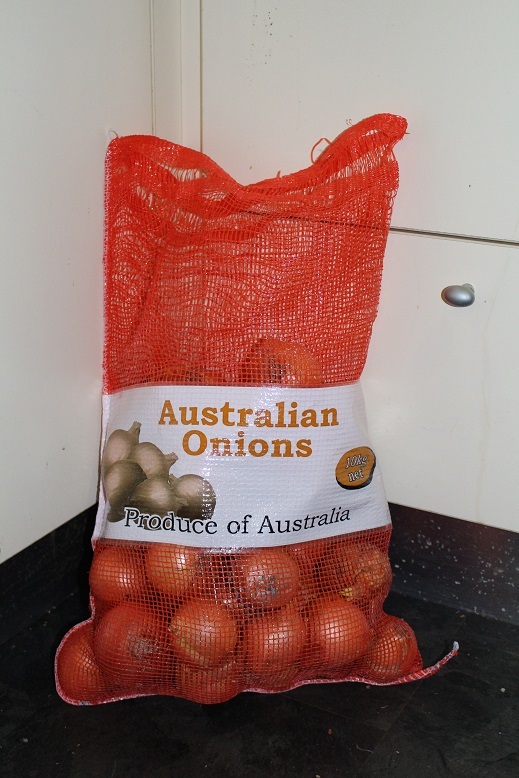 I bought this 10kg bag of onions last weekend for $7.99. 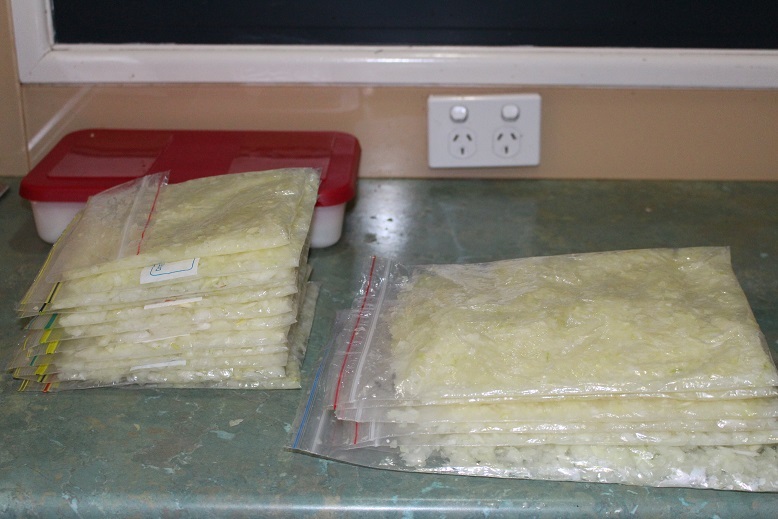 I shared a couple of kilos with a friend and had used a few myself but today it was time to prepare them. I peel and quarter the onions before chopping them in lots using the food processor. First I filled the four trays of the dehydrator. When the onion is thoroughly dried I will grind it to make flakes/powder. It takes up very little space and stores well. I bagged the remainder of the chopped onions in as many ziplock bags as I could muster. I do not buy ziplock bags. I collect mine through “dumpster diving”. There are people in my office who bring 2 Weetbix to work for their breakfast in a brand new ziplock bag, tip them into a bowl and toss the bag in the bin. If I open the bin and the discarded bag is on the top I simply bring it home and wash it for reuse. Anyway, I digress – the chopped onion is in ziplock bags. I pack 150g which is equivalent to a medium onion in the small bags and 300g in the larger bags. I ended up with 10 small packs and 7 large packs of diced onion. Because I packed the diced onion fairly flat, it is easy to break off a section if you only want a small amount of onion. I sliced the remaining onions by hand and they are packed in the red lidded container. This means that that I will not need to chop or slice an onion for several months.